Damien is a veteran member of the band having joined in 1999. 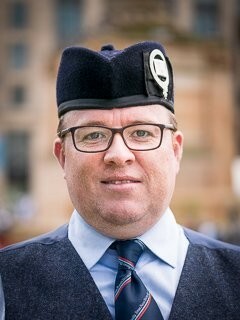 The 2017 World Pipe Band Championships marked 18 consecutive years competing with the band, and he has won the Worlds on three occasions with the band. Apart from competing at the World’s, Damien has had the opportunity to play all over the world as a member of the band. Damien considers the Affirmation concert in 2009 the highlight of his piping career, with the Worlds win in 2008 running a close second. Outside of all of the playing achievements, Damien also values the friendships and camaraderie he’s had throughout the years with his fellow bandmates. Outside of the band, Damien enjoys spending time with his wife (and former band member) Angela, and their two boys.